NEW BEDFORD, Mass. — Southcoast Health announced today the launch of its new mobile application (app), providing patients and families with a one-stop mobile information hub for navigating the Southcoast Health patient experience. 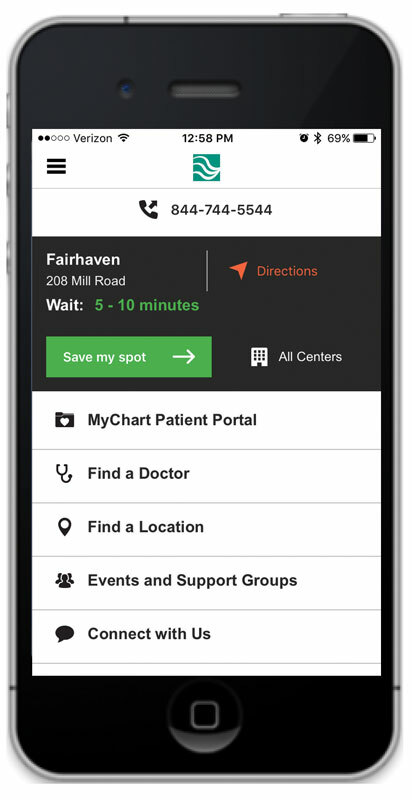 Benefits to app users include access to more than 650 medical providers in the Southcoast Health Network, and its three acute-care hospitals, dozens of ambulatory locations and growing lineup of Urgent Care centers. In fact, users can locate the closest Urgent Care center, see its current wait time, and reserve a spot in line directly from their mobile device. “At Southcoast Health, we are constantly looking for ways to improve the consumer and patient experience by increasing access and convenience – providing our current and future patients with what they want, when and how they want it. In today’s mobile world, an app is an important access point to the information that patients want at their fingertips,” said Keith A. Hovan, President & CEO of Southcoast Health. This new app addresses the growing need for immediate access to healthcare information. Southcoast Health patients can directly access their MyChart patient portal, where they can check lab results, refill prescriptions, communicate with their physician and much more. Dates and locations for events and support groups are also available through the apps calendar feature. The Southcoast Health app, developed for Apple and Android, is now available for free on iTunes and the Google Play store.